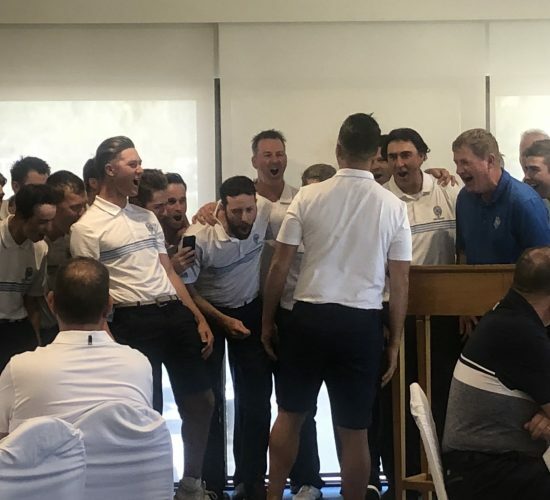 The Brisbane Golf Club produced its second away win of the year against Keperra Golf Club yesterday winning 12.5-8.5. The win keeps BGC at the top of the table with 7 points and undefeated in 2018. After four rounds, BGC has now won three matches and had one draw. KGC has a rich history in Division 1 and BGC has the utmost respect for what they have achieved over many years. It was stunning to learn at the presentations that yesterday’s loss to BGC was their first at home in almost 25 years. This is an amazing statistic and one that proves their quality. BGC needed a team effort to secure the win and all three teams across Juniors, Opens and the Masters contributed valuable points. In the Juniors, Bailey Ittensohn dominated from the start to win his first match of the year 4&3 whilst Jordan Hampson grinded all day to secure his valuable point 2&1. Our Opens lost 8-3 in the corresponding match last year but turned the tables this time around to win 6.5-4.5. Our ‘big five’ of Cox, Flynn, Powell, Dobbelaar and Carlson secured 4 out of a possible 5 points at the top which was an incredible effort. Sam Howse and Ilija Soldan both recorded their first wins of the season winning 6&4 and 4&3 respectively whilst Wade Edwards squared his match. The Masters were again dominant winning 4-1 away and are looking likely to again win their individual Pennant. The Masters have secured 15 out of a possible 20 points this season. Rick Davenport (2 up), Gary Brodie (2&1), Phil Melksham (5&3) and Warwick Oxenford (3&1) all won their matches. Royal Queensland defeated Nudgee Golf Club 12.5-8.5 in the other Division 1 match played yesterday. BGC can secure back-to-back BDGA Division 1 Pennants if they can defeat Nudgee Golf Club away this weekend and KGC defeat RQ at home. Both Royal Queensland Golf Club and KGC can also win the Pennant. RQ has two away games whilst KGC has both an away and home game. Anything can happen in the last two rounds and we only need to look back twelve months to see how quickly momentum can change in such a tight and hard-fought competition. NGC with only 1 point from the first four rounds will need maximum points from their next two home games to avoid relegation to Division 2. The score line when the two teams played in Round 2 didn’t reflect the closeness of the match overall and another tough challenge is expected. Once again the first match will tee off at 7am. Yesterday’s win ensures BGC would remain in Division 1 for a third consecutive year in 2019.